We have 12 locations in four counties (Ector, Howard, Reeves and Ward), which currently serve 934 head start children and families. 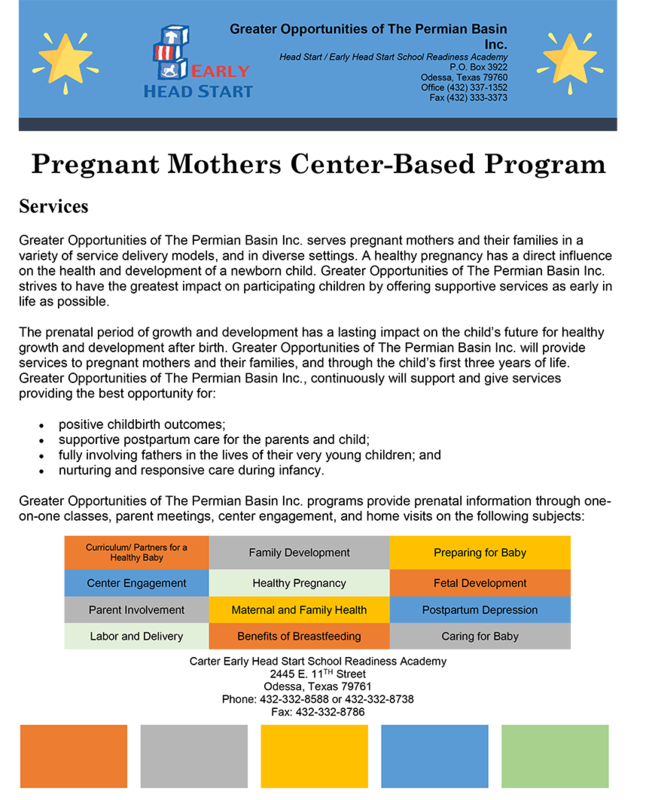 Parents information and resources related to Head Start enrollment and participation. Greater Opportunities of the Permian Basin, Inc is a nonprofit organization in Odessa, Texas. We are dedicated to providing Head Start services for families in the western Texas area. Our philosophy is that a child can benefit most from a comprehensive disciplinary program that fosters development and remedies problems as expressed in a broad range of services. The child's entire family, as well as the community must be involved. The Head Start program is a family-focused program focusing on childhood education, giving children the opportunity to reach their maximum potential. All stakeholders will respond positively to challenges and change when they are involved in the process. Parents are the first teachers, but we all have a responsibility for the education of our children and must serve as positive role models. Everyone can learn when the necessary tools are provided. Providing the necessary resources and support will help our families become self-sufficient. All people have the right to self-determination and expression of individuality. Our families are important consumers and will be treated with dignity and respect by our entire staff. A child can achieve his/her full potential with support, early intervention, and inspiration from the Head Start family. Children are entitled to positive self-esteem and feel that they are as important as anyone else. We can raise self-esteem and help children learn respect for themselves and others. Provide Complete Medical Evaluations & Appropriate Professionals for Eligible Head Start Children. Promote Preventive Health & Dental Care, Early Detection & Intervention of Problems. Link Families to an on-Going Health Care System That Will Ensure Continued Care for Each Child after Leaving the Head Start Program. Establish & Maintain Individual Health Records in Order to Implement Preventive & Restorative Treatment. Improve a Child's Present Health by Identifying All Potential Existing Health Problems. Follow-up Monitoring Child's Health Status. Ensure That Each Child Has a Physical Examination as Part of a Complete Health Evaluation. Ensure a Child's Future by Providing Preventive Health Services including Immunizations against Infectious Diseases & Health Education for Children, Parents, & Staff. Our mission is to provide a positive learning experience in a safe and healthy environment that will improve the quality of life for the children, service, and empower them to become self-sufficient, contributing members of the community. Head Start will become the standard for comprehensive childcare and family services with shared resources, greater collaboration cooperation and increased community standards. A child can benefit most from a comprehensive disciplinary program to foster development and remedy problems as expressed in a broad range of services. The child's entire family, as well as the community, must be involved. The Head Start Program is a family focused program. The Head Start environment will provide the children the opportunity to develop to their maximum potential. Contact us to learn more about the Head Start program.